Superheroes are all the rage on television these days, with multiple shows covering both Marvel and DC properties. Ironically enough, it seems that while Marvel might know how to do films, it's DC that's winning the battle on the small screen. Shows like Flash, Green Arrow, and Gotham continue to do well for them, with spin offs coming soon. 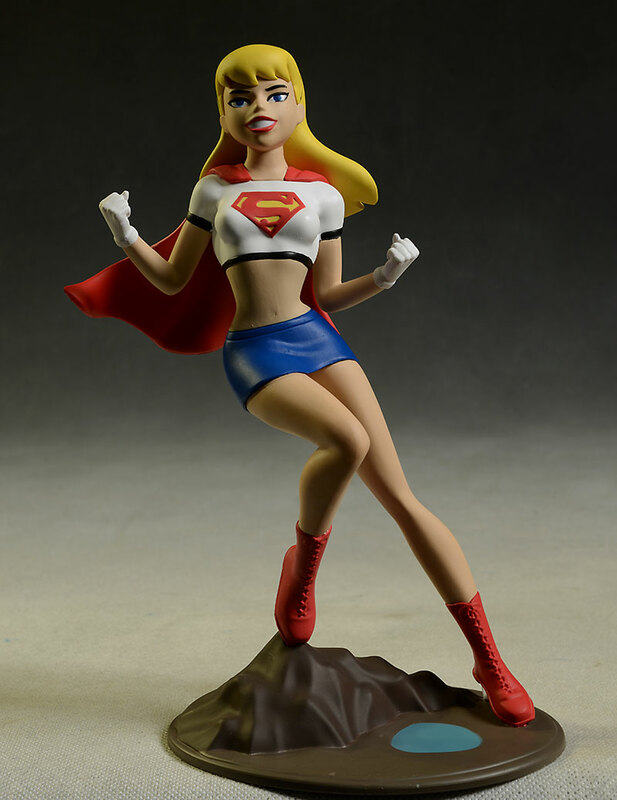 Another DC character is due to hit at the end of next month: Supergirl, airing on CBS. This is a character that hasn't gotten a ton of love over the years outside the comics, but I suspect that's about to change. They were showing the entire first episode at SDCC last summer, and I took the time to check it out. If you're a fan of the style, tempo and attitude of The Flash, I think you're going to enjoy Supergirl, at least based on the initial episode. 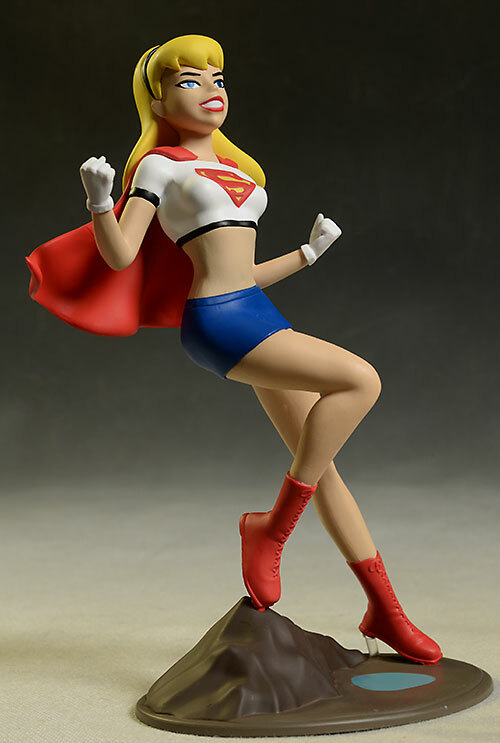 There was another television Supergirl though, and it was a good one. 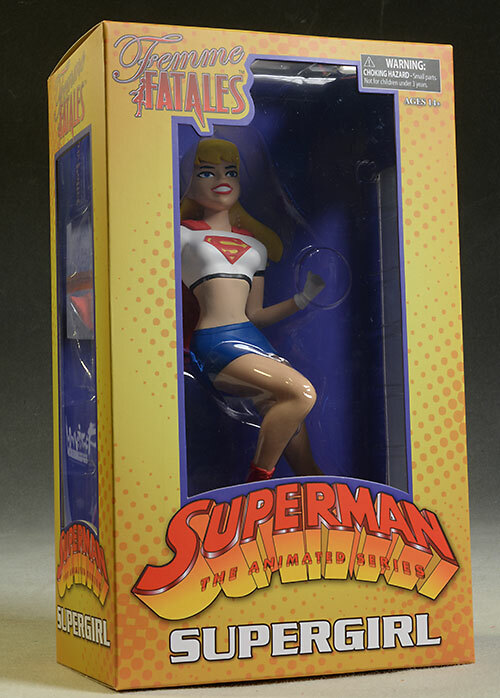 She popped up on the show Superman: The Animated Series back in the 90's. Done in an artistic style similar to Batman: The Animated Series, I really liked the designs and concepts of the show. I never thought the writing was up to the high bar set by BTAS, but it was nice to see the world of Supes get at least a little attention. All this leads to tonight's review. 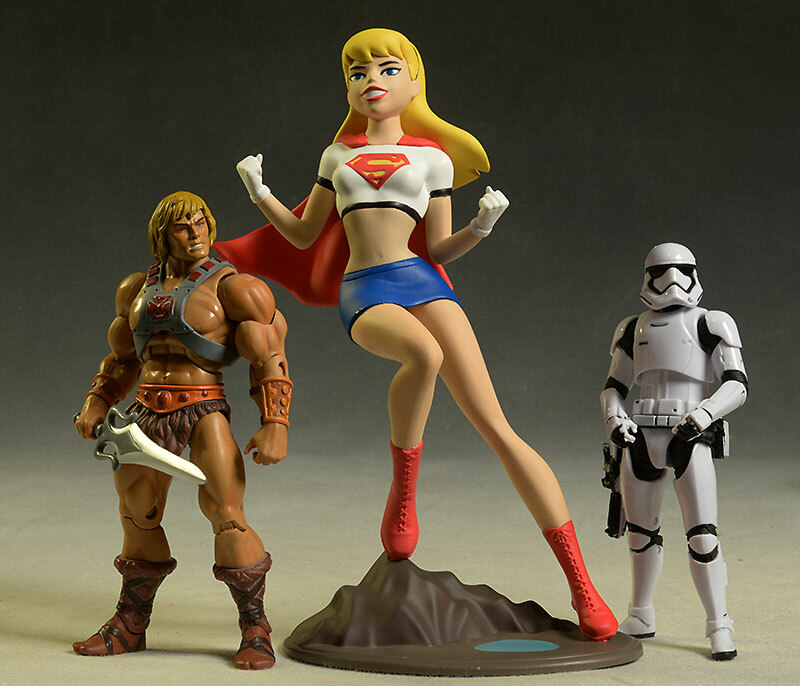 Diamond Select Toys has started a new line of lower priced statues called Femme Fatales. These are in that 9 - 10" range, and are made from PVC and other materials similar to what we've seen from Kotobukiya in the past. 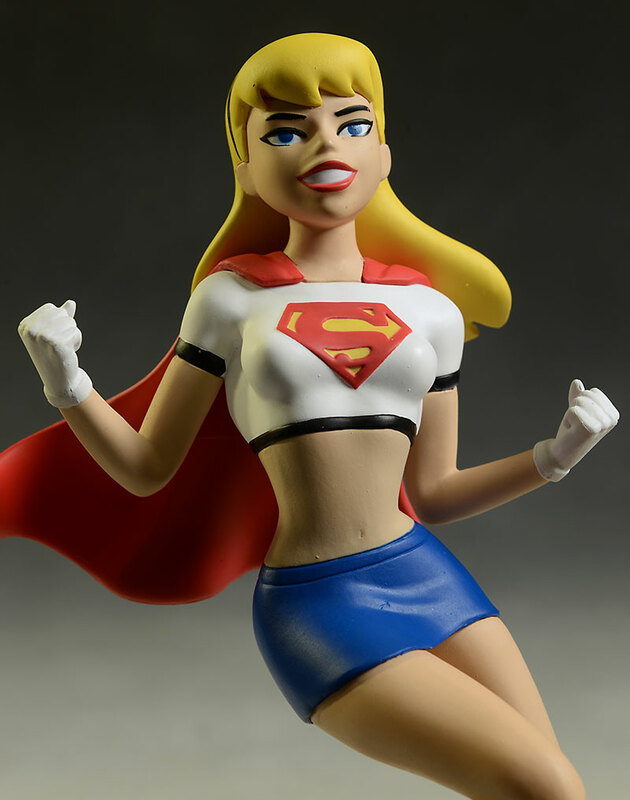 The range of characters is pretty broad, and I've been sticking to only the animated style, which means I've only picked up the SDCC exclusive Harley so far. 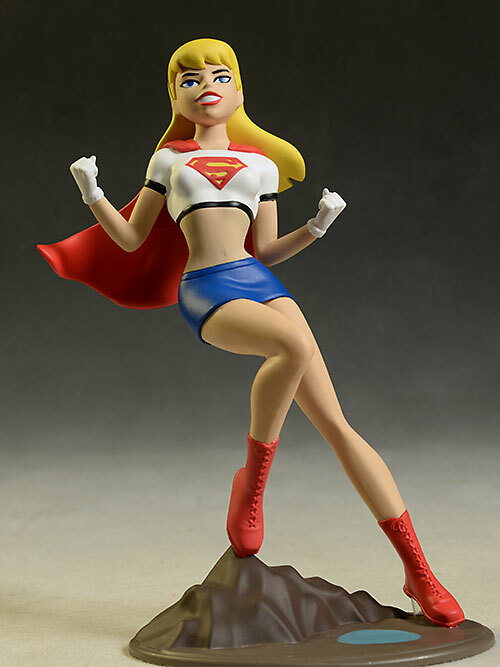 The first regular statue to ship that's in an animated style is Supergirl, based on her STAS look. These will run you $40 - $45 at most retailers, but I've seen them on pre-order for as low as $36. Other animated ladies coming soon include Batgirl, Wonder Woman, Poison Ivy, and Talia, making this an excellent opportunity to add some cartoon variety to the display of beautiful comic book women on your shelf. The box is attractive and sturdy, and has windows on the sides and front to allow you to see the statue itself. I'm always a big fan of that, since paint quality can vary quite a bit from piece to piece. However, it doesn't allow you to see the base particularly well, and considering my issues with that aspect (more on that in a minute), I consider that an issue. The box is collector friendly though, and it's quite easy to remove the statue (it's all one piece) from the interior plastic trays without any real damage. Sure, you'll have to cut a couple small pieces of tape, but no normal person considers that 'damage'. I spent a lot of time considering my score in this category, because this is not an issue of quality but aesthetics. I love this animated style, and they have done a marvelous job capturing the proportions and design. I love the bright smile, and bubbly attitude that comes through in the expression, and I'm all for a dynamic look. The texture is good (there should be none for an animated character like this), and there's the right amount of edge detail and sharpness when it's appropriate. But I really, really dislike this pose. The marketing text says she "rests atop a rocky outcropping, ready to hurl herself at the next foe to threaten her cousin or her favorite city." She doesn't look like she's about to hurl herself at anyone, and that's definitely not a rocky outcropping. At first I thought she might be leaping, but sideways? Or perhaps she's landing...but the backward lean of her body doesn't suggest that either. The distribution of her weight and the angle of her legs makes for a very awkward stance overall. And then it hit me - she's not standing, landing or taking off. She's flying mid-air! That's not a rocky outcropping, but the peak of a mountain far below, and that odd splotch of bluish paint is meant to be a lake! Yes, I know it's a stretch, and if she's flying why is her toes physically touching the base...but it was the best I could come up with. And I still, really, really, dislike the pose. To go along with the wonky pose is a very poorly done base. It's a cheaper plastic, and while I'm all for the idea of less-is-more with an animated design, the base takes it to a level that ends up looking too cheap and toy-ish. The good news is the paint quality is quite a bit better. I really like the work on the eyes, lips and teeth, and the edges on the emblem are super clean and sharp. There is some slop around the black edging of the shirt, and there's even a little dirt in the skin and skirt. The base isn't doing her any favors in this category either, with that weird blue-green circle that I assume is supposed to be a puddle or a lake or the tears of her enemies, but overall the paint quality is right where I'd expect for a statue in this price range. There seems to be a movement towards producing the best statues possible at a lower price. We've seen Kotobukiya doing it with their 7" scale ArtFX+ line that run around $30, and even their Bishoujo statues are under $60 at most places. At $40 - $45 each, these fit right in. That's a very solid, above average value for statues that are this quality, particularly with the paint application. While I'd like to see the bases improve, getting them for a price similar to a high end 6 - 7" action figure is not something I'll be complaining about. Obviously you'll want to avoid any weird, one off paint issues, but the windows on the box allow you to pick out the best at your local comic shop. Other than that, you should have no problems. My overall could be very, very different from yours. It could be with any collectible review - we all have varying ideas and tastes - but when it's so heavily based on the visual appeal of the design, we are more likely to disagree. The quality of the sculpt and paint is not the problem (although that base is probably going to e an issue for everyone). The size and price are a good fit for the market and current tastes. But that pose...oh, that pose. I'm really not feeling it, and the longer I looked at it the less I liked it. If you don't have the same sort of aversion to her stance, you'll score her much better overall. 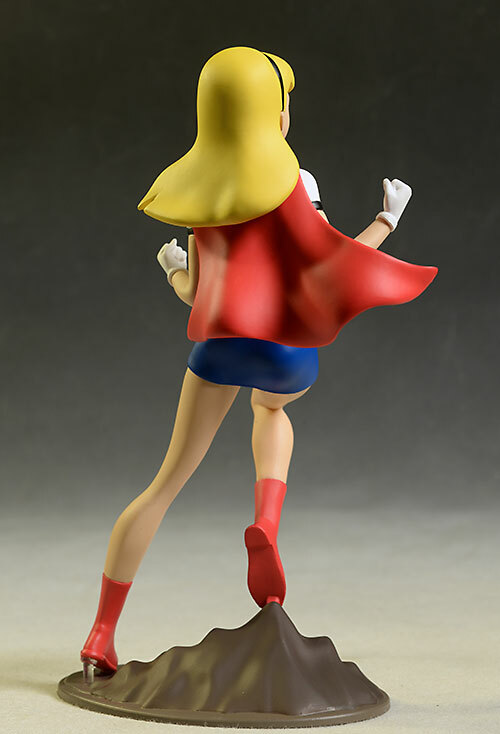 Thankfully, the majority of the upcoming statues in the line (at least in terms of the animated ones) are better designs, and I have high hopes that this will be a great set of statues to add to the display. - has her in stock for $40. - comes in at $40.50. - Entertainment Earth is at $40. 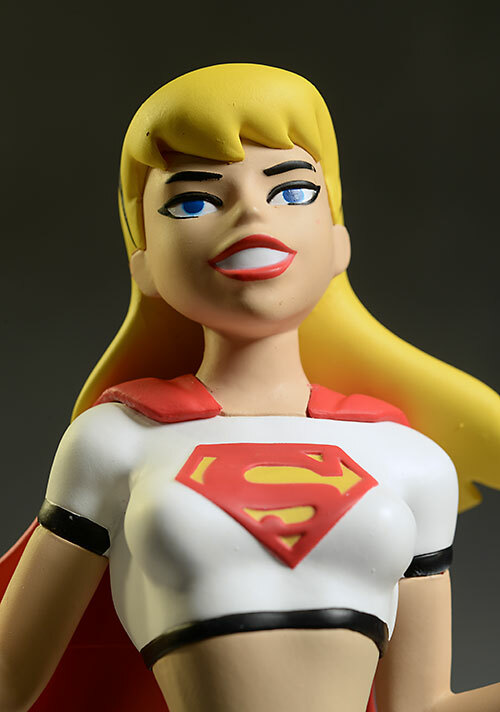 Other Supergirl reviews include the DC Bombshells statue, the Evil and Good Bishoujo statues, the DC Covergirls version, the Elseworlds action figure, the DC Superheroes action figure, and waaay back, there's the Animated Series action figure.